Hi guys! Today I wanted to share with you a fun craft using egg shells. For chapter 4 in Story of the World Vol 2 we learned all about the Byzantine Empire. One of the projects the book suggested was a Byzantine Mosaic. The suggested activity was a little time consuming and messy so we went with an easier process and it turned out wonderfully. Egg Shells ( I used one egg for each child) soak the egg shells in some soap and water for a couple of hours. Let them dry and your ready to use them. 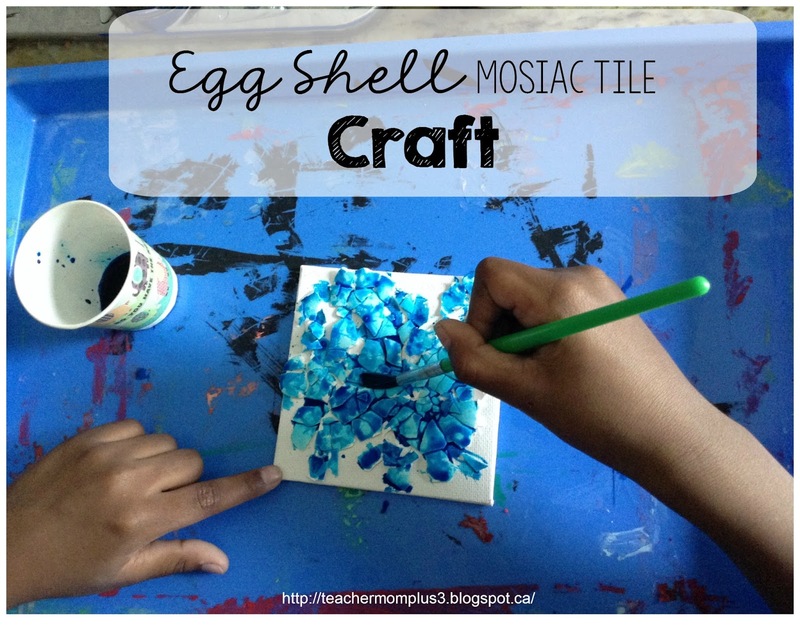 Pour Glue onto the canvas tile, crush the egg shell onto the glue and leave to dry. Once the egg shell has dried and adhered to the canvass paint over it with your chose of water color. Let it dry. I had the boys lightly paint using a tapping motion. If you use hard strokes the egg shells will peel off. After the paint dries pour some of the pouring medium. It gives it a thick glossy finish and it also keeps the egg shells from falling off. I purchased mine from Michael's. Leave it to dry for 24 hours. We only had blue liquid water color but if you have more colors it would turn out really nice. I wish the picture captured how glossy and glass like it turned out. That's it! The project was really simple and it turned out beautiful. We will be making more of these mosaics once I get more water colors. Visit Ayan's profile on Pinterest. "It is only those who love knowledge among His servants that fear Allah." The printables shared on this site are FREE of charge and you are welcome to download them for your personal and/or classroom use only. You ARE allowed to pin photos on Pinterest with a link back to the post. I appreciate pins! If you download and use some of my printables and then blog about them, please provide a link back to my blog and let me know ~ I’d love to see how you are using them! Please be sure to link to the blog post or web page - and not directly to the file itself. Thank you! However, all opinions expressed on TeacherMomPlus3 are solely my own, and I only suggest products or services that I believe will be helpful to you. Sources. Simple theme. Powered by Blogger.